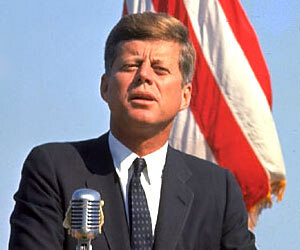 AS THE FIFTIETH ANNIVERSARY of the assassination of President John Fitzgerald Kennedy approaches (November 22, 1963), I have been watching -- in my spare time, of course -- videos about this national tragedy, which was (and is) emblematic of a most serious problem to peace-loving people around the world. Namely, the absolute corruption of absolute power. I believe JFK was one of many victims of the "Military-Industrial-Complex" (Eisenhower) power struggle going on everywhere around us. The brutal rule of tyrants throughout history is no longer a remote concern reserved only for far-flung lands, never touching our home shores. See InfoWars. The mass media of audio, video, and print have supplemented our basic modes of communication to accelerate the spread of information around the globe. Technology has parted the curtains hiding the indescribable cruelty of human beings to each other. The sad reality of sin and misery bear their full fruit every day, and we may post its evidence online for a digital world to see. Witness the murder of JFK. Literally. A casual search on YouTube yields volumes of video and websites to research any subject. This ability only asks for sufficient time in the day and life of Internet citizens to expose themselves to what could otherwise be satisfactorily ignored for sanity's sake. Let me suggest Richard Belzer, Jim Marrs, and Mark Lane as excellent starting points to research this most intriguing subject. The general consensus, in my opinion, of these sources is that our own Central Intelligence Agency plays an essential role in many high- and low-profile crimes justified in the name of national security. God is the Ultimate Judge of mankind -- indeed, of creation. It behooves His creatures (you and me) to look to Him for trust in His goodness and judgment, and to rely on His salvation in His Son Jesus Christ. Things can be awful in this life. But only Jesus saves to the uttermost!